It's Friday again and that means it's time for a Winter Wonderland posting! This week the lovely Miria is hosting our challenge of 'Santa Claus is Coming to Town' ... always a fun and popular challenge and one we hope you can join in with too. 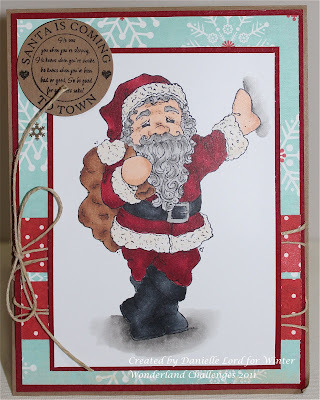 I had this lovely Magnolia Santa in my pile of stamped images. I coloured him up with my copics and kept the card layout pretty straight forward and simple. Papers are a Bo-Bunny double sided sheet and still one of my favourite christmas papers around! I added some twine and tied a simple bow and added the Magnolia sentiment. Here's the finished inside of the card. 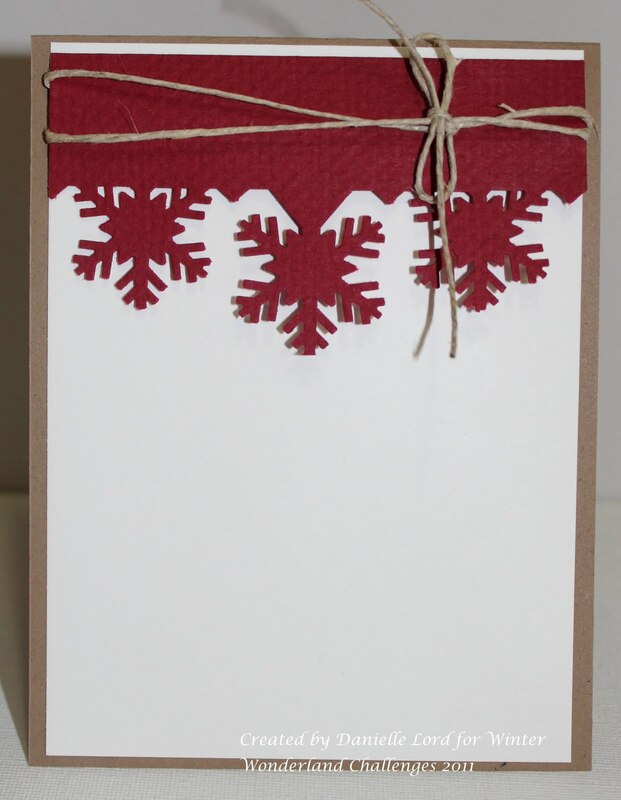 It's very simple using an EK Success deep border snowflake punch to decorate the top of the card with another twine bow to complement the front. Thanks for stopping in today and taking a peek at my project! Although the boys have returned to school this week it has been emotionally tiring for them ... especially my little guy Jacob who just started full-time school! He has come home every evening totally exhausted and cried before falling asleep saying he doesn't want to go back to school ... he'd much rather stay home and watch a movie on the couch with his mommy! I'm sure after the weekend and a good rest he'll be ready to start another week and hopefully each day will just get easier for him. I hope I can get some more inky time in this weekend ... it definitely helps me recharge my batteries! Have a great one and I hope to be back to a more regular blogging schedule once things settle down a bit next week! fabulous colour combo and a great layout. Santa is just so special. I love this card. Now this has me in the Christmas Spirit! Really pretty Danielle. My heart goes out to Jacob. My son was like that and actually he still likes being at home. Danielle, your card has such a country charm to it. You have totally outdone yourself with those copics, the shading under his feet is very nicely done. I love that EK success punch. I may have to invest in that one. 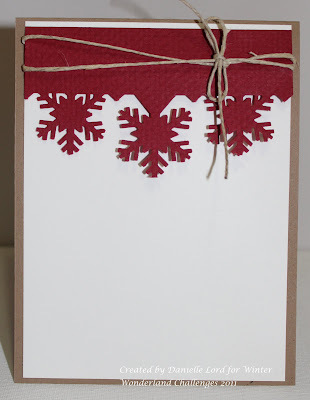 Is it a new one this year or does Michaels still have it.I love how you have added the twine...that is a superb idea! Gorgeous, great papers and love the inside too. 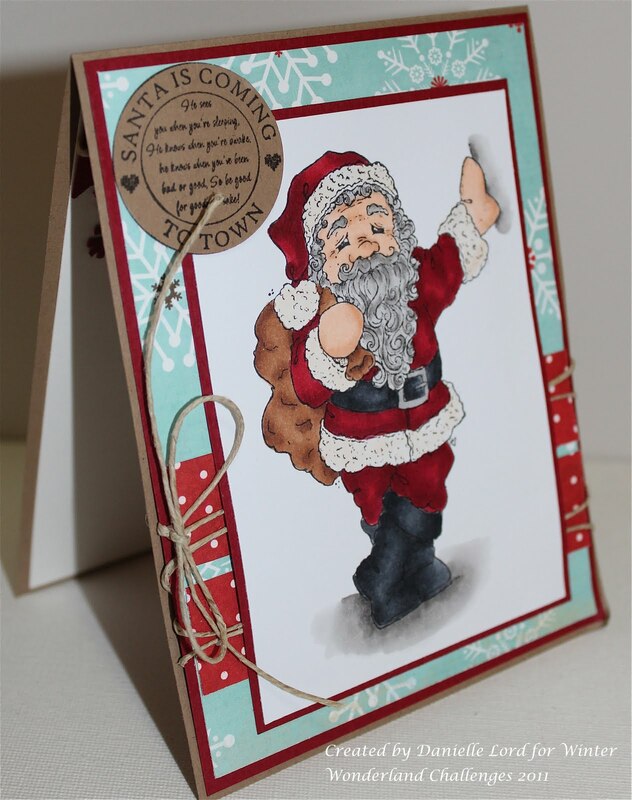 Thanks so much for joining in with us at the Charisma Cardz challenge this week. Well, Fabulous colour combination and a great layout. Santa is just so special in your blog. Santa Claus is coming to town but his tour is going to start from your blog post. This is smashing. Super image. Thanks for joining us at Sparkles Forum Christmas Challenge. Good luck. i like your Santa card but the out lines are to much .